Due diligence is one of the most vital components of valuing and finalizing an investment. It presents buyers and sellers with a comprehensive look at potential investments, themselves, or a buyer. The final product of due diligence is a thorough report that summarizes the process and supplements the decision-making. In this article, we explain due diligence report fundamentals, detail due diligence questionnaires, and show how DealRoom streamlines the process. Writing a due diligence report is typically the next step that follows the investigation process. After excavating all of the necessary information from rigorous research and investigations, you must compile the results into an organized document. A due diligence report is essentially a document that contains a detailed summary of the due diligence process. Why do We Need to Make a Report? This report captures the findings of the diligence process. In turn, it allows investors to have a more clear understanding of the investigated firm. A complete and well-documented report supplements the decision-making process for investors and business considering finalizing deals and contracts. Additionally, it substantiates forecasts for the target company’s future and lifespan. Take businesses 'A' and 'B' for example. Business 'A' has done its financial due diligence and has its report. On the other hand, business 'B' has not completed any due diligence or a report. Assume that both businesses require loans from the bank. Business 'A' can refer to their due diligence report and precisely predict how long it will take to repay the loan. They can more accurately discern what to do with the loan to yield the most effective and efficient results. Business 'B', on the other hand, can only make loose assumptions and estimations. Without background knowledge, these assumptions and estimations run a higher likelihood of being incorrect. The areas of concentration for the report is dependent on what type of due diligence you are utilizing. For example, a report resulting from financial due diligence will look and have different information versus one from customer due diligence. Likewise, a financial due diligence report created for administrative purposes will differ from those written in preparation for mergers and acquisitions. You wouldn’t expect an administrative due diligence report to contain more information on customers than the administration of a business. When performing hedge fund due diligence, you would assess a reservoir of investment funds and the general partners who own it. Therefore, there are as many different types of reports as types of due diligence itself. Each corresponding report type has distinguishing properties. Organizing all of the loose facts and data gathered from due diligence into a clean report can seem rather daunting. Luckily, we’ve compiled a sample due diligence report to follow whether the investigation was routine or for merger or acquisition. 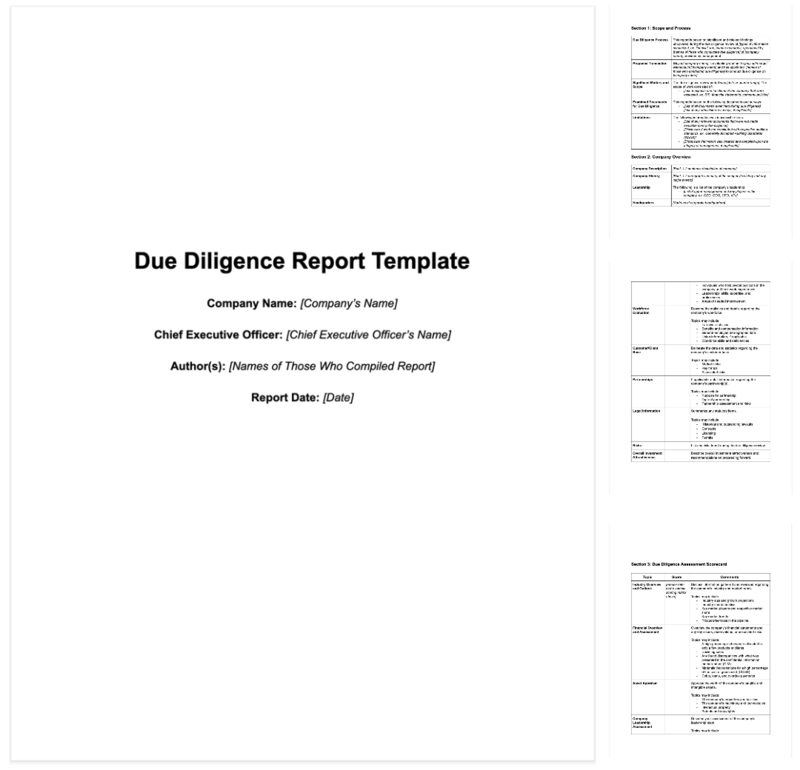 What Should be in a Due Diligence Report? Information on the finances of the company. This includes financial statements for past years, tax returns, and documents from accounts receivable. If there is no separate section for loans and debts, then they should fall here automatically. Information about the company's employees. This catalogues information on the people holding pivotal positions in the company and their work experiences. It may also house data on retired employees too and their pension details. Information on the assets of the company. This includes material on the company’s different facilities, machinery, and intangible assets such as intellectual property or copyrights. Information on partners, suppliers, and customers. This details more about the different parties in the firm’s supply chain and their relationships with them. Legal information about the company. This refers to items such as historical and outstanding lawsuits, contracts, licensing, and permits. Due diligence reports are generally compiled by a company’s internal due diligence team or a paid third-party group. Your team may comprise of attorneys, financial consultants, and any subject matter experts that pertain to the seller. Overall, the collective expertise should encompass the various business, legal, technical, and financial matters respective to the deal at hand. However, in smaller-scale instances, such as buying a small business, may not require more than one or two professionals. Conducting due diligence, creating, and reviewing the report should be a team effort. Meaning, if contracting with an external party, you should not entirely outsource them. Some information may not be meant for them. Internal employees should also be involved in the process. Most importantly, you need to be certain that the individuals on your team are people that you trust, service agreements aside. The last thing you want is to be left with a faulty investment because of a team’s lackadaisical diligence. A due diligence questionnaire is a list of investigative questions that is forwarded to the selling company to glean information. Depending on the type of due diligence, it may also be sent to their partners, suppliers, and even customers. The questionnaires should be highly detailed and in-depth. They should prompt for pertinent information to provide an overview and duly supplement the analyse associated with due diligence. Before an investment manager or potential buyer starts delving into a business’ secrets, they must sign a Letter of Intent (LOI). This contractually displays interest in buying or investing in the firm or private equity, however, it is not binding. Why do You Need a Due Diligence Questionnaire? Due diligence questionnaires are an essential early step in the process. The questionnaire serves as a means of obtaining the information you need. It offers the party handling the process foreknowledge of what to expect and how to go about it. Additionally, it will help those executing the process know what to concentrate on and safeguard against misplacing priorities. Furthermore, due diligence questionnaires, just like the due diligence report, are contingent upon what is being investigated. For example, vendor due diligence questionnaire should be somewhat different from an acquisitions due diligence questionnaire. Are there any ongoing or suspended legal proceedings? Licenses and permits? Some companies find themselves in legal situations that are almost impossible to recover from. You do not want to acquire a firm that is pervading with legal issues and have to suffer the consequences. Likewise, you need to be attentive to applicable licenses and permits for proper upkeep. You can download a due diligence questionnaire on our site for free by simply entering your working email. Visit our CHECKLIST page and get it in one click. Compiling a due diligence report may seem as intimidating as the research portion of the investigation. An improper, carelessly made report could throw away all of the work done to this point. Be patient, thorough, and attentive to details. The process is going to take time. A suitable report cannot be tossed together at the final hour. To fully reap the reports’ benefits, you will need to be at thorough as possible when logging your findings. Without a comprehensive report to refer to, it is almost like you just threw away the previous painstaking investigations and research. Don’t lose focus on what’s important. With that being said, ensure you are writing about relevant subject matter. While the information you are handling may be overwhelming, you want to stick to what the report is actually on. For instance, if you are writing a customer due diligence report, you don't need to dwell much on a business’ liabilities. Be concise. Likewise, you don’t want the report to go on and on and on. Investors would likely not want to read through every minute detail, thus defeating the purpose of the report. Ask questions. You want to believe that a seller is honest. However, it is not uncommon for them to fluff information in the confidential information memorandum (CIM). Anytime you see something that looks off, ask questions. Additionally, you should interview people that are not directly related to the transaction for a more holistic view of a firm. Seek legal assistance. Unless you are an attorney, property manager, or investments manager, you should seek legal help and advice. This way, you negate the possibility of running into law, jurisdictional, or compliance issues down the line. DealRoom is a functional due diligence software that helps streamline the process. Traditionally, you would find yourself creating folders within a software and then separately forwarding the due diligence list to clients. With DealRoom, you are able to seamlessly populate due diligence folders and create lists within the same room.